With winter technically over, I've started to to reflect on how my fishing improved and what I can do better next time. This was my second winter fishing, but the first one I managed to actually catch fish. I don't think I was fishing really badly before, but the margin between no fish and lots of fish can be slim during cold weather. 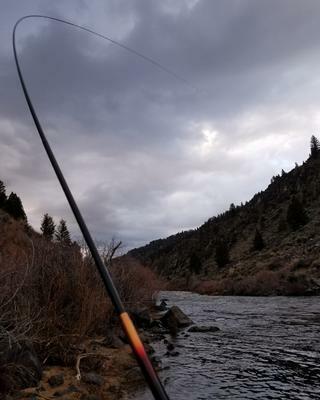 Below are some random thoughts regarding tenkara fishing SW Montana during the cold months. The first challenge is simply dealing with the cold. Dress warm, bring multiple pairs of gloves, bring snacks and warm fluids. Wet felt boots ball up with snow, you're better off with rubber, maybe even add some mini-crampons. Try to find where a spring enters the river, as it will help fend off the solid ice sheets. If you venture out onto the ice, make damn sure that the water below is shallow. It helps to be familiar with the terrain before winter. Warm afternoons were generally more successful than the cold sufferfests. Now that we're pretty sure we aren't going to die, it's time to think about the fishing equipment. Put the dry flies and kebari away, and get out the bead-heads. I carried a selection of simple nymphs from small (#18) to large (#10), natural to shiny, slim to meaty. Different weights were achieved by using different sized tungsten beads. That pretty much covered it. A long, sensitive rod with a light line a little shorter than the rod is all you need. Getting the flies to the bottom and maintaining contact are key. I put a small spot of keiryu yarn at the end of my hi-vis line and hold that an inch of so above the surface. I adjust depth by changing the tippet length. That part is critical. If your tippet is 6" too short, you won't catch fish. Brave the frozen fingers, tie just enough tippet that you start snagging caddis houses, and go find the fish. I find that imparting just a little lifelike movement resulted in more fish than a simple dead drift. Lots of fish get picked up on the lift. Search through the deep, slow runs, changing flies and action, and keep checking that you're still on the bottom. Once you find a fish, stay there. The trout really congregate in winter. You should develop a rhythm of fish catching. When it slows down, change flies and catch a new batch of fish. I don't know why they all have such different preferences, but they do. You can pretty much cycle through your box and keep catching fish. Strike detection is harder in the winter. The fish just aren't very aggressive. Keep the line tight, slightly lead the flies, and watch and feel for any hesitation that could be a strike. You won't believe how subtle the takes can be. I tie my nymphs on thin needle-point hooks, so I can solidly set the hook with a minimal twitch of my wrist. If the take was all in my imagination, I can continue the drift uninterrupted. I'll often set two or three times during one short drift. I think a lot of these techniques will continue to work year round. Keep them in mind for when the dry fly fishing slows down. I cannot add anything to that excellent post, but I would suggest that if you use a shorter line and longer tippet (as long as you will need for the deepest runs or pools), and place the keiryu marker yarn knots (I use at least three, in two colors) on the tippet below the end of the line, you can just adjust the position of the yarn markers rather than changing tippet length. Still keep the lowest one above the surface, which may put the end of your hi-vis line quite a bit above the surface, but that's OK. Watch the markers, not the line. Tying knots with cold hands is hard. This way you won't have to tie nearly as many knots and will use less tippet. I'll have to try that when I get my keiryu yarn back from my parents. Do you taper the tippet so you don't lose the entire length when you get a snag? Aside from that, the only issue I could see is managing more of that hard to see tippet (when not immediately fishing). It might not be a problem most of the time. Excellent post, Phillip, and good tips all. Deep and slow seem to be the keys in winter, though sometimes you have to vary the approach. I, too, have had many fish respond to a gentle lift and light twitch.